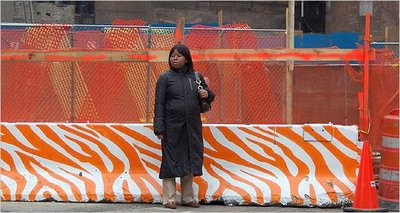 Civic Center Residents Coalition NYC: "....we certainly have a lot of practice right now"
"....we certainly have a lot of practice right now"
Perhaps by "practice" he is referring to the way they simply dressed up the concrete barricades all over the Wall St. district. It does take a lot of "practice" to do what they do. NYC has gotten to the point where construction takes SO long to complete that it seems strangely normal to have artists (paid for by The Downtown Alliance and of all places the M.T.A for gosh sakes!) 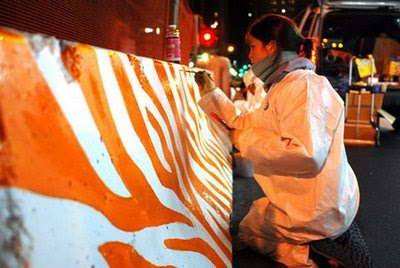 at a cost of $100,000.00 paint "art" on what is supposed to be TEMPORARY crash barriers that surround construction sites. HOW INSULTING IS THIS!? Rather than just make the project move faster, in their infinite "wisdom" the City and non-profits have figured out a way to pacify the public and shift our attention away from the fact that THEY'RE TAKING TOO DAMN LONG TO FINISH WHAT THEY STARTED ! It should come as no surprise then when the businesses and residents in Chinatown grimace at the thought of starting one of the most expensive and disruptive reconstruction projects at the most vulnerable intersection in Manhattan during one of the WORST times in our economic history. Those poor bastards near Wall St. have been begging for the streets to be finished, and instead got "art" painted on what they wanted removed. The current Mayor and the one before him took great pride in visiting Asia during their time in City Hall. They brought back what seemed to them to be "great ideas" to be dumped on our great City as if to say , "we too can live like Singaporeans if simply make a few changes". Let's tax drivers of cars and trucks! The Mayor loves to cite London as his inspiration for Congestion pricing, but we all know the idea was spawned from visits to Singapore by both Guiliani and Bloomberg. The very word Singapore conjurs images of caning and dictatorships in the minds of Americans. Better to have said the idea came from London. I have yet to meet a New Yorker yearning to want to be more Singaporean. In contrast even Madonna wants to be more British. What the Mayors should have brought back was the practice in Asia where contractors are under strict incentives to finish on time (bonuses) or else they face fines for finishing projects late. Somehow that didn't seem appropriate to import. Instead we got stuck with him pushing for congestion pricing. Doesn't it make sense to simply have projects finish on time, does that not make for LESS CONGESTION?! and put money into the City coffers. Instead we have zebra stripes on concrete crash barriers. "Ms. Berger, the alliance president, said she hoped that one day as many as 60 public sites and 20 private projects downtown could have artistically redesigned barriers." Lovely. Why didn't they think of this sooner? Perhaps a huge tarp over Ground Zero with imaginitive print will further distract us from the fact that it's still a hole in the ground and not a tax producing commerce inducing economic engine onto itself. Yes, the DOT and the City have a lot of practice in pulling the wool over our eyes when it comes to the way they rush their projects through communities and when they take forever to finish, they literally paint over the problem. HEY Chatham Square is scheduled (and this is what the are ADMITTING TO) to take three years to complete! Can't you just see the Chinatown barrier stencils being prepared as we speak with "culturally appropriate" ethnic symbols and imagery intended to "blend and compliment with the local character of the neighborhood" - close your eyes, you can see it too right? Dragon scales instead of zebra stripes, Longevity - Happiness - and Long Life spelled out in celebration of our Lunar Year - all the things we will wish we had once the reconstruction of Chatham Square began. Give me a break, don't even think about starting any reconstruction here ! We're on to you. And we vote. Sure - a lot of practice ignoring community feedback and doing exactly what the mayor demands of them. New York's loss of democratic process over the past 2 administrations is scary. Our last 2 mayors have acted like they OWN the city - with virtually no resistance from other elected officials. At least we had Mark Green fighting back against Giuliani. Who do we have fighting back against Bloomberg?